It was once a truism that red had no endgame. That has not been true for a long time. When you can turn every Dragon's Claw, Raging Goblin, and Goblin Assault into fire, it may never be true again. Oh, and apparently the Magmaw has worshippers in Zendikar. That's sure to end well. Constructed: I would not expect to see it much for it's cost and it does not have haste or flying. But it does have a nice ability to sacrifice some useless stuff. Casual & Multiplayer: Someone will have alot of fun with their big red and green decks, with alot of tokens and other stuff to throw at you. Limited: This set will be a stand alone set for drafts. So it will be interesting to see how well it drafts as a whole. I believe this will be a good card. Once it hits the battlefield it will be a problem. Overall this is a great preview card for red, for the casual group. Welcome back readers today’s card of the day is an interesting new elemental from Rise of The Eldrazi, Magmaw, a decently sized creature that can sacrifice nonland permanents to deal 1 damage to target creature or player. Having seen some of the cards from Rise of the Eldrazi, Eldrazi spawn tokens should not be in short supply. Luckily Magmaw is not too particular about what type of tokens he devours, any way you can fuel creatures onto the field is fine. Good as a game finisher the 4/4 body means he can often go on offense if the situation requires it and can survive a Lightning Bolt. In standard this card reminds me of Magnivore, I do not know if its merely the name or the ability of it to act as a finisher in decks. The major weakness of this card is being unable to sacrifice lands seeing as they are what you want to sacrifice most to enable this card as a finisher. In extended and eternal this card is to slow and mana intensive. In casual and multiplayer this card can sacrifice excess tokens or anything that is being hit with a removal spell, as long as you hold mana open. Holding at least one mana back means this guy wont be hit by removal, although he may not be the biggest target starting off. In limited anything that can act as removal will see play, this card swings and can sacrifice your nonland cards to take out pesky creatures or finish the game. Overall this is an exciting elemental card with more casual uses then constructed. We will see what the future holds for this card. 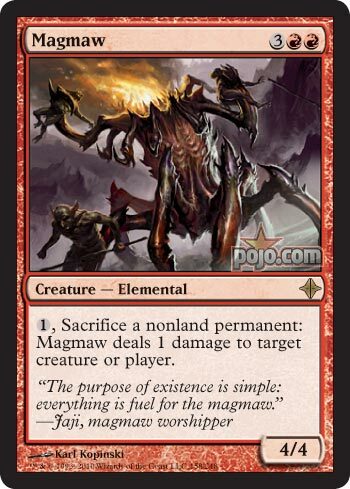 Today we are reviewing the exclusive preview card Magmaw which is a five mana 4/4 Red elemental that allows you to sacrifice nonland permanents to deal damage to a creature or player. It costs one mana for each activation, but turns anything that isn't a land into a Mogg Fanatic. An interesting effect if you can produce enough fuel for the fire it can win a game, but otherwise the card is a bit lacking. For Constructed, Casual, and Multiplayer I don't really see this becoming very popular as it takes too much to do too little. It could possibly be combined with a major token generation, but at that point the swarm itself can just win instead. In Limited this is a five mana 4/4 which is playable and the effect can be a bit more useful as a choice of removal which makes this a decent, but not great first pick in Booster. In Sealed the double Red is manageable at the cost and a larger creature with no drawback and a potentially useful effect is worth running if in your colors.